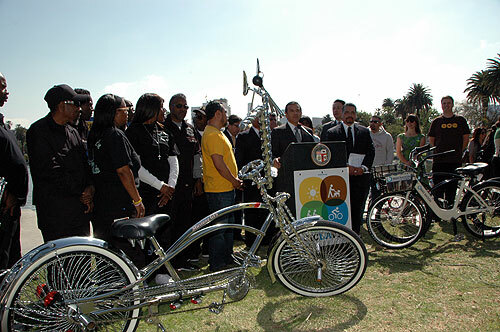 Los Angeles Mayor Antonio Villaraigosa and a contingent of other local public officials, event organizers and cyclists this morning touted the fourth CicLAvia that will soon hit city streets on Sunday, April 15. The 10-mile route through L.A. streets will be car-free for walking, biking and playing. 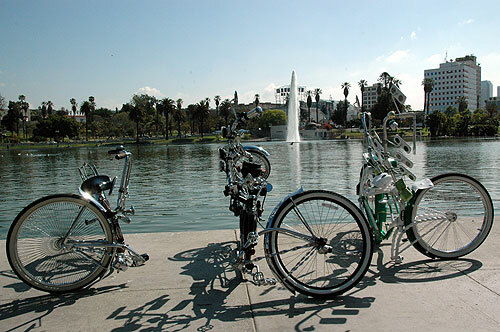 Bike Nation, a L.A. area bike sharing company, will provide 100 free rental bikes to the first Angelenos who sign up online through the CicLAvia web site. A new Spanish language Public Service Announcement is now available to advocate safety for Los Angeles’ large Spanish-speaking community. Check the PSA out here. The message for all Angelinos every day: drive safely, be courteous, follow the rules and share the road. CicLAvia riders can utilize Metro Rail to most easily access the route, as many bus routes will be detoured in the area. Metro will be adding train cars on the Red, Purple and Gold lines in anticipation of the crowds for the event. One of the issues Metro had with past CicLAvias is crowding at stations directly along the route at MacArthur Park and 7th/Metro Center, for example. Riders are encouraged to use other rail stops as well. Also, when the event ends at 3 p.m., riders are encouraged to hang around a little longer to avoid overcrowding the stations. Grab some coffee or a snack and chill out for awhile and let the Metro system safely absorb the multitude of event-goers returning home at the same time. If an arriving train is full, please wait for the next train. Never force your bike into a crowded train. If you have a folding bike, make sure it is properly folded. Your bike must not block the train operator’s door, aisle ways or train doors. Give priority to wheelchair passengers in designated areas. Recumbent bikes must be under 6 feet. Bikes not permitted: Scooters, tandem, 3-wheeled, fuel-powered, and bike trailers (also no infant or child trailers). Real Rydaz Low Rider bike club representing well in your photos! Look for them at CicLAvia on April 15th! Awesome photo Joe thanks for the invite with the mayor, it was an amazing day.